The latest paroxysm (nr 17 in 2013) at the New SE crater of Mt Etna occurred this morning, just less than one week after the previous one last weekend. First signs of activity had become evident last evening with weak occasional explosions at the New SE crater. The strombolian activity increased quickly starting from about 10:30 local time and merged into violent lava fountains. The eruption today was much faster than the previous ones, but the peak phase of lava fountaining, which only lasted about one hour, was particularly intense. It produced tall fountains and a large ash plume of about 6 km height that drifted to the NE (towards Taormina) where heavy ash fall occurred. 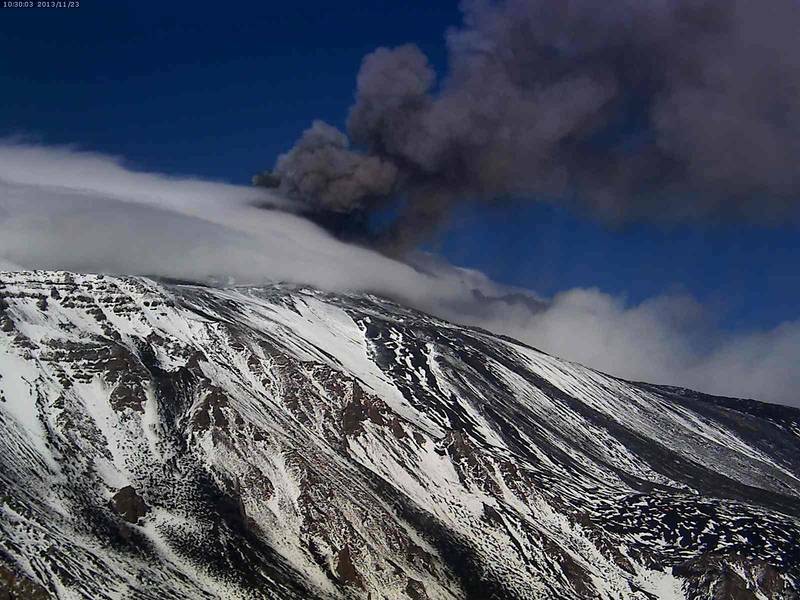 In addition, Etna continues to produce wonderful steam rings. You can follow the activity live at webcams.volcanodiscovery.com (or if you are on a small mobile display, at the mobile optimized version).